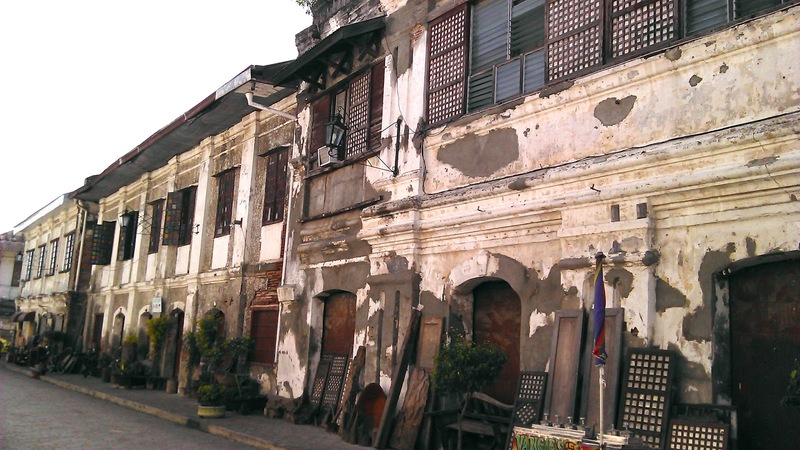 Visiting Vigan, the capital of Ilocos Sur, takes hardy sightseers to a time long forgotten, but it may also satisfy their hunger for more current attractions. The city appeals to both lovers of tradition and culture, as well as the young ones looking for an exciting, new unforgettable experience. So it is not uncommon to see droves of families from three generations traveling to the city as they indulge their respective thrills and fun-filled adventures. Aside from the visit to ancestral houses, there is a zoo with the most exotic of animals roaming freely about, as well as a wide array of delectable Ilocano treats that will appease the discriminating palates of travelers. Make sure the batteries of your digital cameras are well-charged because this is probably one of the most picturesque towns in the country. A time gone by. A visit to the Vigan Heritage Village transports travelers to a world chockful of history and tradition. There are old Spanish-era churches such as the Vigan Cathedral (St. Paul Metropolitan Cathedral) across the Plaza Salcedo, and the Shrine to the Nuestra Señora de la Caridad (Our Lady of Charity) in the town of Bantay, with their earthquake baroque architecture, and simply decorated altars. Climb the red-brick belfry of the Nuestra Señora de la Caridad to see the centuries-old bells, and for an amazing panoramic view of Vigan. Drop by the Pagburnayan in Barangay 7, where sturdy clay jars (burnay) continue to be churned out by hand with craftsmen still using a potter’s wheel. Most of their jars, I am told, are transported to Manila for private individuals and commercial buyers. The Mestizo District (“Kasanglayan”—Sanglay, being a Spanish term for natives of China) with its cobblestone streets where Chinese merchants once owned stalls, is the epicenter of the Heritage Village. Here, two-story houses owned by the merchants had their stores located on the ground floor of the houses, while the living quarters were on the second floor. These days, stores selling souvenir items—T-shirts, native bags, woven Abel Iloko blankets and linen, antiques—and restaurants occupy the ground floors of these ancestral homes. If you could talk to the animals. Both kids and adults will enjoy a visit to Baluarte (“bailiwick”), the mini-zoo that sits in the vast estate owned by Ilocos Sur Gov. Chavit Singson in Barangay Salindeng. Here, miniature horses and alpacas roam, freely interacting with visitors. Also on display in cages are two hefty Siberian tigers; an albino python and an assortment of reptiles; and butterflies in a covered sanctuary. Best of all, entrance is free. Weaves of wonder. Aside from burnay, products made from handwoven cotton or abel (now marketed as Abel Iloko) continue to be in demand among tourists. At Barangay Camangan, just a short ride from Plaza Burgos, is where a lot of the weavers do their work, spinning yarns of cotton into comfortable pieces of bed linen, towels, robes and tablecloth. Guests may buy the handloomed items at very attractive prices. Unearthing the old. “Antiquing” or scouring for old furniture, home accessories and kitchenware is a favorite pastime of many tourists to Vigan. A few of the stores along Calle Crisologo and adjoining streets carry some wonderful vintage finds (e.g., charcoal iron presses, gas lamps, blue and white china, stained-glass windows made into dividers, etc.) that may be repurposed as accessories in one’s home. As is our usual Pinoy custom, haggle like there’s no tomorrow. Most often, the price these “antiques” dealers quote on an item you fancy will be double than what they are actually worth. Taste tests. Like its sister to the north, Ilocos Sur, especially Vigan, has its own culinary finds. Aside from the longganisa, what creature can resist the allure and deeply satisfying heart-stopping goodness of the bagnet (twice-fried crispy pork belly)? Get it from the Vigan Public Market; ask the friendly locals for stall referrals to make sure the bagnet you get is fried in fresh oil, not stale cooking oil. 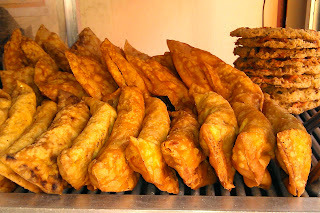 When dipped in the local vinegar (sukang Iloko), the crispy fried empanada (Irene’s Empanada, Calle Crisologo) filled with skinless longganiza Vigan, vegetables and egg, makes a delectable afternoon snack after a half-day of sightseeing. Another wildly tasty treat is the Royal Bibingka made from glutinous rice flour and baked in ovens. There are three outlets that sell the Royal Bibingka —Tongson’s (Crisologo Street) is said to be the pioneer, followed by the breakaway group of The Sisters (Naguiddyan, Bantay) and Marsha’s Delicacies (National Highway, Bantay). Where to stay. Villa Angela Heritage House (26 Quirino Boulevard) offers value-for-money accommodations to travelers who want to relax in spacious rooms with the Spanish era-theme. Its staff are “notorious” for being very accommodating, engaging and friendly to guests. What’s more, the breakfast is authentic homey Ilocano, which keeps guests hankering for more. The inn is also popular because it is where American actor Tom Cruise stayed while filming Platoon. So if you’re a fan, it would be a real treat if you could book the same room he stayed in. Also steeped in Spanish colonial architecture and furnishings, Vigan Plaza Hotel along Mena Crisologo Street is well-liked by tourists for its central location. The hotel has modern amenities and uses secure SIM card-based system for its doors. It has Internet connection and cable TV. It also offers in-room massages, perfect for those tired aching feet from the heritage walks. Make sure to reserve a room with windows. Getting there. The fastest way to get to Vigan, Ilocos Sur, is to take an hour’s flight to Laoag City in Ilocos Norte (via Philippine Airlines or Cebu Pacific), then get on a bus for a two-hour ride to Vigan. Among the major bus lines plying the Laoag-Vigan route are Partas Bus, Fariñas Transportation, Maria de Leon Bus Lines, Florida Bus and RCJ Bus Lines. If you want the slow, scenic tour from Manila, check out the eight-hour daily trips offered by Partas Bus, Dominion Bus, Aniceto Bus and Viron Transit. For more details, check out http://www.vigancity.gov.ph. If you don’t want to be a slave to a bus company’s departures and arrivals schedule, take a road trip on a sturdy SUV with friends or family. The route is easy; you take the North Luzon Expressway, then use the SCTEx to head out to Tarlac, then traverse the well-paved Manila-Ilocos highway to reach Vigan. That way, you can stop at leisure at roadside stalls that catch your fancy, at restaurants for your meals; and for those all-important pee breaks. Best of all, you get to see the splendid vistas unfold in the countryside. More on Vigan at http://www.vigan.ph.